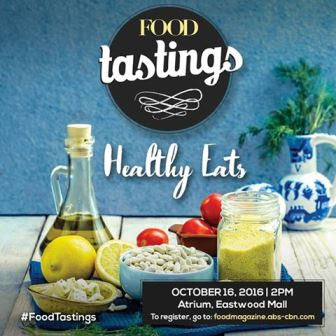 Eating healthy is enjoyable and Food Magazine is ready to prove it with “Food Tasting: Healthy Eats!” Head over to the Atrium at the Eastwood Mall on October 16, 2016, 2 PM, to learn how to make delicious dishes that won’t leave you feeling guilty. This is the third installment of Food Magazine’s series of cooking demos from some of the most respected and renowned chefs in the country. Healthy Eats will feature recipes from Chef Tatung Sarthou of Alab, Chef Onie Castillo of Café Enye, Chefs Gerard Mangente and John Vince Mangibin from Liberty, and Chefs Ron Comia and Richelle Bautista from Richmonde Hotel. Chef Ron and Chef Richelle will present their healthy take on the classic chicken empanada. The team from Liberty, Chef Gerard and Chef John Vince, will share with us how to make a delicious rice dish, Salmon and Black Arroz. Last but not least, Chef Onie will show us how to make a favorite in Spanish cuisine with a fishy twist. Chef Sonia Astudillo from Tefal and Lifestyle’s Chef Sandy Daza will also be on hand to teach guests tasty dishes that can nourish the body. Guests will be treated not just to cooking demos but also to tasting the food made by the incredible chefs! Food Tasting: Healthy Eats offers a twist to the usual cooking demo by showcasing the best from some of Eastwood Mall’s most acclaimed restaurants. This event is co-presented by Arla and sponsored by Tefal. Many thanks to our official media partners, NoInk and WhenInManila.com. Special thanks as well to Brownies Unlimited, Downtown Cookies, Richmonde Hotel, Liberty, Cafe Enye, and BTS Event Technology.